Rolling Stone Farm will be standing four licensed and approved Hanoverian and/or stallions for the upcoming breeding season. Our own stallion ES Gold Luck continues to add to his reputation of producing excellent dressage prospects with powerful gaits and good temperaments for amateurs and professionals alike. Many of our clients have sent in glowing updates of their Gold Luck youngsters successes. This year we are excited to once again to have the lovely young homebred stallions Shakespeare RSF and Fhitzgerald on hand to compliment some of our many broodmares. Finally, The 1987 imported chestnut Elite Hanoverian Stallion ES Welcome S (World Cup I-Grebina/Grande) has arrived and will be on lease for the 2009 season and will also be available to outside mares. The coolest horse on the entire farm, this wonderful guy needs little introduction. We are so privileged to stand him as our breeding stallion, it is really beyond words. His stamp is on each and every one of the foals he sires. Gold Luck is by the legendary Grand Prix Dressage Stallion Grundstein, who was imported to the US after siring 13 approved sons. Shakespeare RSF was the top colt at his AHS inspection. 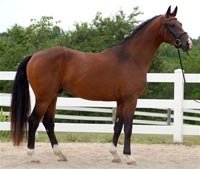 He shows wonderful rideability with three very good gaits. Shakespeare also demonstrates good form over fences and free jumping easily over five foot jumps. 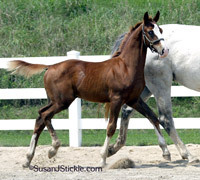 2008 was Shakespeare's first year at stud. Well, we re- presented F. Scott to the GOV inspectors on July 14, 2008. He jumped super through our chute, as he always does, clearing 4'3" with ease, without ever changing his approach or beautiful hunter form. Then, he was shown under saddle where he showed his fabulous rideability, walk, and canter. They would have liked to have seen more trot from him, but we don't ride our horses like jazzed up auction horses. What you see is what is there, naturally. We are excited to breed a few mares to him in 2009 and to see what will happen regarding the 30 and 70 day test being set up in America, now that the 100 day test has disbanded. I'll try and take some new photos of him.